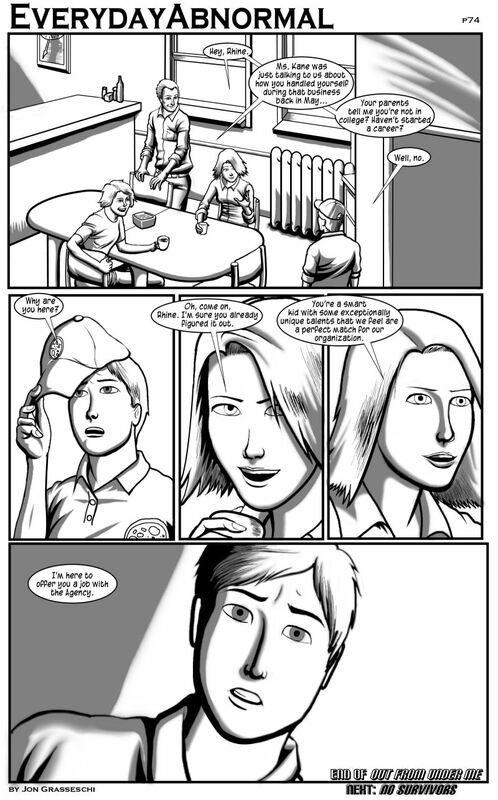 EverydayAbnormal is going on hiatus for a few weeks while I work on "No Survivors." I'm kind of planning on EA returning mid-June, so hopefully that'll give me enough time to finish up some pages and actually have a buffer for once in my life. In the meantime, I'm going to celebrate this milestone by treating myself to working on other stuff. (I may have a drawing addiction. Not sure.) So, until "No Survivors" begins, Fridays are going to be "Fanart Fridays," wherein I draw fanart for some of my favorite ComicFury comics. And, of course, ComiCafe will still be updating every week (or most weeks, anyway). I want to thank all of you for following this comic... you guys are really the first fans I've ever had, and I'm lucky as hell to have such a cool, smart, enthusiastic bunch reading my work. Congratulations mate, awesome first chapter, a great start for things to come. You managed to create a believable universe filled with what I think it's more important, believable and compelling characters. Great job! That was a great opening chapter. Patiently looking forward to the next one! Good luck with the hiatus. Well done! This has been awesome so far, and I look forward to more awesomeness! Well done sir. This was an absolute joy to read. I look forward to the next chapter. @FFAA: Wow, that's high praise, man. I appreciate it! @Jrade: Well, stealing things is to be expected, from Kristy at least. She tells me she's a ninja. Believe me, you guys don't want me to fight over someone's top spot. It's happened before, innocent bystanders get caught in the cross fire, hospitals for ill and/or mentally sick fox cubs burn to the ground, random stickmen get blamed for it and ultra comboed out of cafés, it's not a pretty sight. Excellent read Jon, very much liked your tale...so much so I gave you a rating of 6, but the internet rat took one of the points for himself.... sorry bout' that. I can't wait to see the next story arc, and if this ritual is going to have any reprocussions, AND if we can find out more about the Agency and how it got started. So many new questions! Can't wait to read what happens next! Thank you very kindly, KarToon! Let me know what you think of Chapter 2 (which, as I'm typing this is almost finished). Excellent first chapter. Though I'm a little sad that the robot man isn't joining the team. But we have not seen the last of him!